Lyndon Fire Chief, Russ Rakestraw, had a goal to reach. He wanted to decrease his Body Fat Percentage from 33% down to 26%. Being the leader of his firehouse meant he needed to set the example. 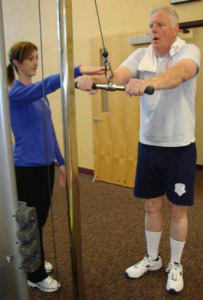 He wanted to improve his health through proper nutrition and exercise. 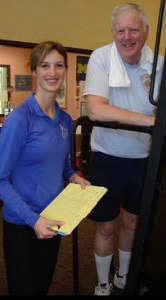 Russ began working regularly with Personal Trainer Lisa Groft in 2007. They meet once a week to weigh in but also for accountability. With her encouragement and expertise he was able to reduce his body fat percentage, significantly. In order to form stronger nutritional habits, Lisa encouraged Russ to participate in the HMR Weight Management Program offered at Milestone. Working with Lisa regularly combined with participating in the HMR program provided Russ with personal results but also assisted him in leading his fire department by modeling good behavior. Without Lisa’s expertise, he would not have been able to accomplish all that he has today!